The full view of parcels and property taxes within C146 are for Cityscape Pro and Cityscape Permits members only. This area is bounded on the north by Lake St., on the south by Columbus Park, and on the west by the neighboring village of Oak Park. The terriain is flat and the area is about 100% built up. There is heavy traffic along Lake St., Washington Blvd. 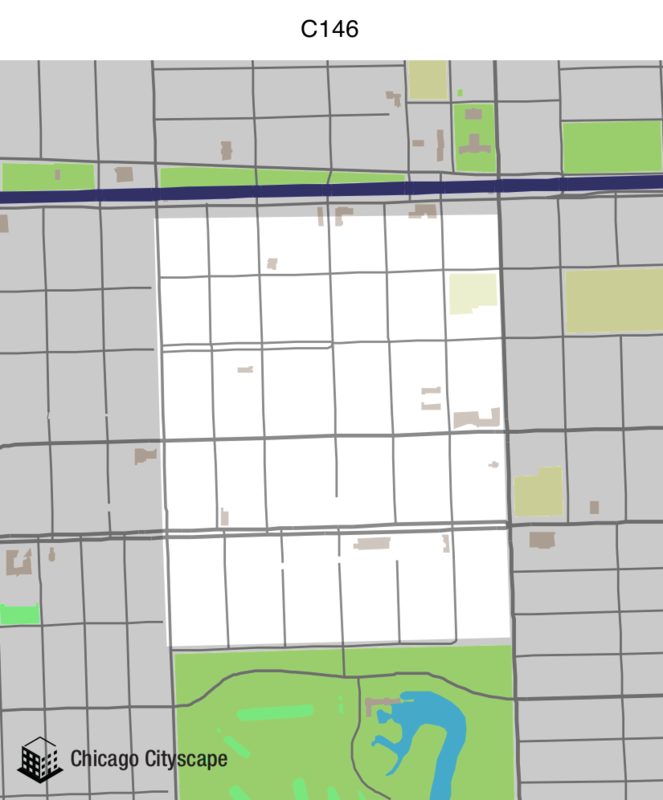 Madison St., Austin Ave. (the western boundary) and Central Ave. (the eastern boundary). High schools, grammar schools, and churches are convenient. Residents shop at fine shopping center in Oak Park. There are also numerouss small stores along Lake St., and along Madison St. There are many large apartment buildings along the boulevards above mentioned, and these are largely occupied by Hebrew tenants. As a whole the area would probably be 20-25% Jewish. Some of this migration is coming from Lawndale and from the southwest side of Chicago. Land values are quite high due to the fact that the area is zoned for apartment buildings. This penalizes single family occupancy because of high taxes based on exclusive land values, which are from $60-80 a front foot, altho one authority estimates them at $100 a front foot. An example of this is shown where HOLC had a house on Mason St. exposed for sale over a (over) period of two years at prices beginning at $6,000 and going down to $4,500. it was finally sold for $3,800. The land alone is taxed based on a valuation exceeding that amount. This area is favored by good transportation and by proximity to a good Catholic Church and parochial school. There are a few scattered two flats in which units rent for about $55. Columbus Park on the south affords exceptional recreational advantages. The Hawthorne Building & Loan, Bell Savings Building & Loan, and Prairie State Bank have loaned in this area, without the FHA insurance provision. The amounts are stated to be up to 50% and in some cases 60%, of current appraisals. Age, slow infiltration, and rather indifferent maintenance have been considered in grading this area "C". You're free to use our static map of C146, but please attribute Chicago Cityscape and link to this page. The area of C146 is 0.3173 square miles. Want to know what you're allowed to build in C146? Order a Zoning Report instantly from MAP Strategies. Show a map of all the Places that overlap C146, including ZIP codes, Census tracts, legislative districts, and TIF districts (this may take awhile if C146 has a large area).